I had expected Wednesday’s session to begin with more downwards movement to a target at 1,975. The session did begin with a little downward movement, but not to a new low and the target was not reached. Thereafter, upwards movement was expected. Summary: Tomorrow I expect at least a little more upwards movement. The short term target is at 2,009. Thereafter, we should see either a five down for a C wave, or overlapping movement for a few days to complete a triangle. The aqua blue trend lines are critical. Draw the first trend line from the low of 1,158.66 on 25th November, 2011, to the next swing low at 1,266.74 on 4th June, 2012. Create a parallel copy and place it on the low at 1,560.33 on 24th June, 2013. While price remains above the lower of these two aqua blue trend lines we must assume the trend remains upwards. This is the main reason for the bullish wave count being my main wave count. There are a couple of things about this wave count of which I am confident. I see minor wave 3 within intermediate wave (1) as over at 1,729.86 (19th September, 2013). It has the strongest upwards momentum and is just 0.76 longer than 2.618 the length of minor wave 1. At 455 days duration this is a remarkably close Fibonacci ratio. The subdivisions within it are perfect. If this is correct then minor wave 4 ends at 1,646.47 and this is where minor wave 5 begins. Because there is already a very close Fibonacci ratio between minor waves 1 and 3 I would not actually expect to see a Fibonacci ratio between minor wave 5 to either of 1 or 3. This means that the target for intermediate wave (1) to end would best be calculated at minute wave degree, within minor wave 5. I will not be able to do that until minute wave iv has ended. Minor wave 5 is unfolding as an impulse. If minor wave 5 has passed its middle then I would expect to see more divergence between price and MACD develop over coming weeks. There is no Fibonacci ratio between minute waves iii and i. This makes it more likely we shall see a Fibonacci ratio between minute wave v and either of iii or i, so when minute wave iv is complete I should be able to calculate a target with a reasonably good probability. 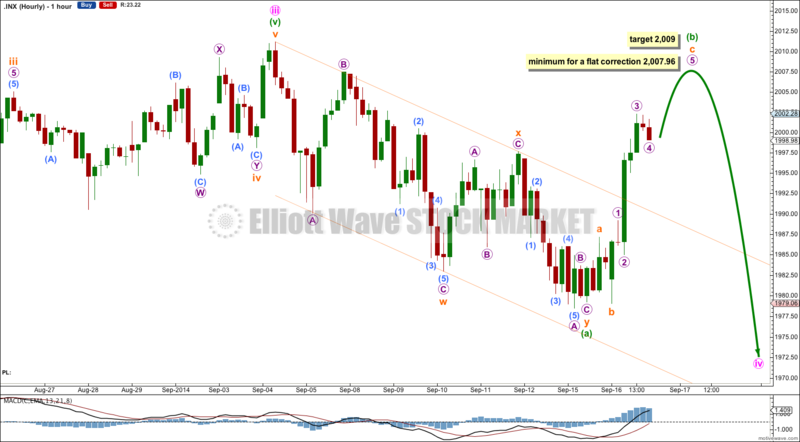 Minute wave ii lasted 14 sessions and was a relatively deep 55% zigzag correction. Given the guideline of alternation I would expect minute wave iv to be a more shallow sideways correction. It is most likely to be a flat, double flat, combination or triangle. These structures tend to be long lasting, so I would expect it may take longer than three weeks. Combinations, expanded flat corrections and running triangles may all include new price extremes beyond their starts. Minute wave iv may include a new high above 2,011.17, should be very choppy and overlapping, and will be difficult to analyse (alternate wave counts will be necessary). While it is unfolding the wave count will change. There are more than thirteen possible structures it may take. I would expect minute wave iv to end short of the upper aqua blue trend line, continuing a pattern the S&P has shown now for over a year. The large maroon – – – channel is copied over from the weekly chart. It is drawn in exactly the same way on bull and bear wave counts. For the bull wave count this channel is termed a base channel about primary waves 1 and 2. A lower degree second wave should not breach the lower edge of a base channel drawn about a first and second wave one or more degrees higher. The lower maroon – – – trend line differentiates the bull and bear wave counts at cycle degree and monthly chart level. A careful analysis of recent movement on the five minute chart sees my wave count changed a little. I expect the double zigzag for minuette wave (a) was already over. Minuette wave (b) is an almost complete expanded flat correction. 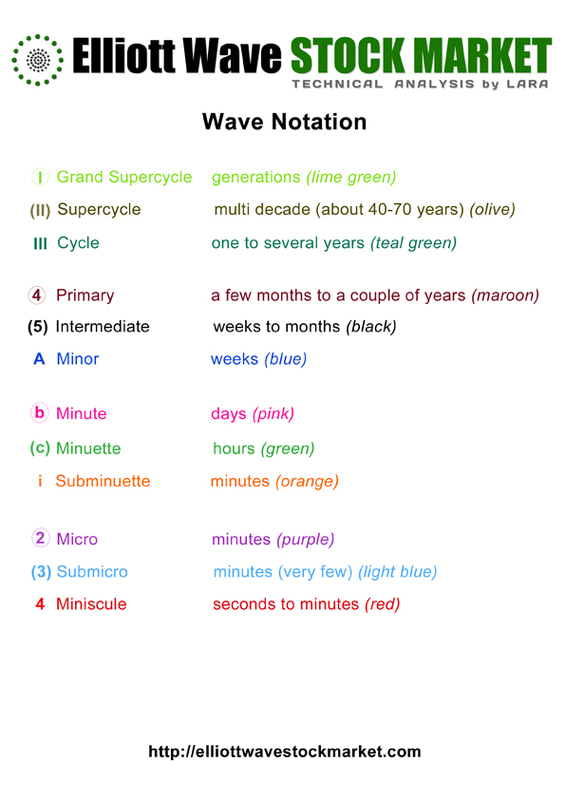 Within minuette wave (b) subminuette wave b is 105% the length of subminuette wave a. Subminuette wave c is almost complete and may not exhibit a Fibonacci ratio to subminuette wave a. Within subminuette wave c micro wave 3 is 0.97 longer than 1.618 the length of micro wave 1. At 2,009 micro wave 5 would reach equality in length with micro wave 1. If micro wave 4 moves lower this target must move correspondingly lower. At this stage minute wave iv may be either a flat, double flat, combination (with the first flat incomplete as labeled here) or a triangle. There are still several structural possibilities for minute wave iv. If minute wave iv is a flat correction then within it minuette wave (b) must reach a minimum of 90% the length of minuette wave (a) at 2,007.96. An expanded flat (the most common type) may see minuette wave (b) move above the start of minuette wave (a) above 2,011.17. If minute wave iv is a triangle there is no minimum requirement for upwards movement tomorrow. If minute wave iv is a running triangle then minuette wave (b) within it may move beyond the start of minuette wave (a) above 2,011.17. If minute wave iv is a flat correction then when minuette wave (b) is over minuette wave (c) should be a five wave structure downwards, and would most likely make a new low below 1,979.22 to avoid a truncation. If minute wave iv is a contracting or barrier triangle then minuette wave (c) may not move beyond the end of minuette wave (a) at 1,979.22. This bearish alternate wave count expects that the correction is not over. The flat correction which ended at 666.79 was only cycle wave a (or w) of a larger super cycle second wave correction. 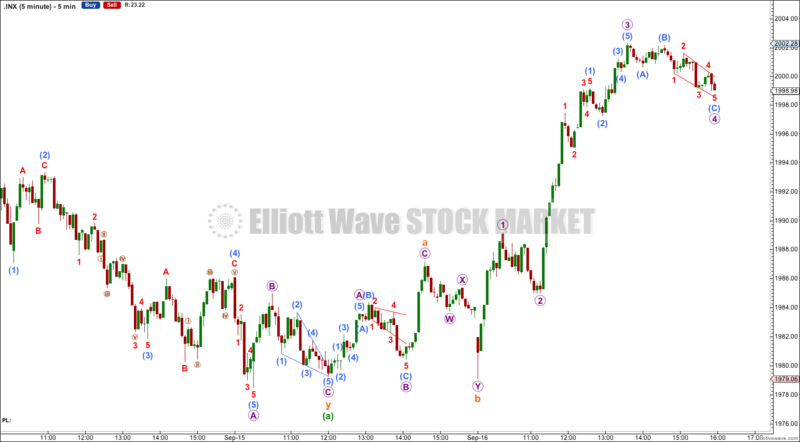 The structure and subdivisions within primary wave C for the bear wave count are the same as for intermediate wave (1) for the bull wave count. Thus the short to mid term outlook is identical. The differentiation between the bull and bear wave count is the maroon – – – channel. 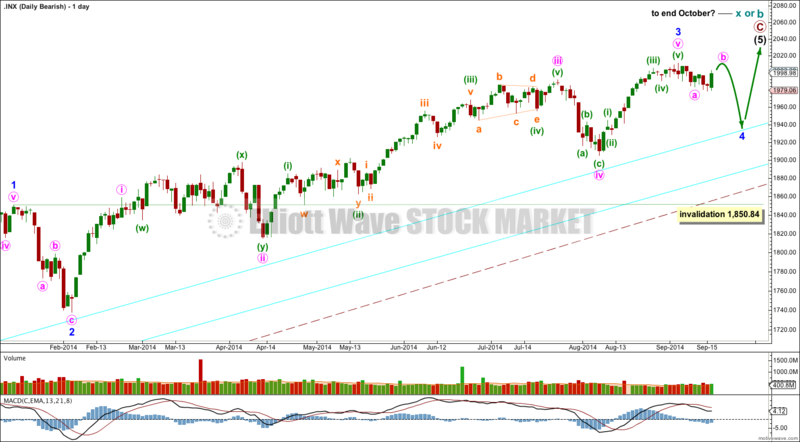 The bull wave count should see price remain above the lower maroon – – – trend line. The bear wave count requires a clear breach of this trend line. If this trend line is breached by a full weekly candlestick below it and not touching it then this bear wave count would be my main wave count and I would then calculate downwards targets. We should always assume the trend remains the same until proven otherwise; the trend is your friend. While price remains above the lower maroon – – – trend line I will assume that the S&P 500 remains within a bull market. This analysis is published about 08:50 p.m. EST. Wednesday’s session saw price move lower and complete as a red candlestick, which is what was expected. The wave count remains the same. Click on the charts below to enlarge. Intermediate wave (4) lasted 14 days, just one more than a Fibonacci 13. If intermediate wave (5) exhibits a Fibonacci time relationship it may end in a Fibonacci 13 days (or sessions) on 28th October. Please note: this is a rough guideline only. Within this wave count there are few Fibonacci time relationships at primary or intermediate degree. Sometimes this happens, but not often enough to be reliable. October is a common month for big trend changes with the S&P 500. This wave count could very well complete the structure for intermediate wave (5) this month, and maybe even this week. Within primary wave C intermediate wave (3) was just 0.76 points longer than 2.618 the length of intermediate wave (1). Ratios within intermediate wave (3) are: minor wave 3 was 16.23 points longer than 1.618 the length of minor wave 1, and minor wave 5 was just 2.14 points short of 0.236 the length of minor wave 3. Ratios within minor wave 3 are: minute wave iii was just 7.66 points longer than 1.618 the length of minute wave i, and minute wave v has no Fibonacci ratio to either of minute waves iii or i. At 1,764 primary wave C would reach equality with primary wave A. If price continues through this first target then the next target would be at 1,781 where intermediate wave (5) would reach 0.236 the length of intermediate wave (3). Within intermediate wave (5) no second wave correction may move beyond the start of the first wave. This wave count is invalidated with movement below 1,646.47. Minor wave 4 is now very likely to be complete. If minor wave 5 lasts three days then intermediate wave (5) would complete in a Fibonacci 13 days (or sessions). Within minor wave 4 showing up on the daily chart this impulsive structure for intermediate wave (5) has a very typical look. Importantly, within intermediate wave (5) minor wave 3 is very slightly shorter than minor wave 1. This limits minor wave 5 to no longer than equality with minor wave 3. If minor wave 5 begins at 1,740.50 this limit is at 1,803.90. At 1,765 minor wave 5 would reach 0.382 the length of minor waves 1 and 3. Minor wave 5 should show a decrease in momentum from that seen for minor wave 3. I have redrawn the parallel channel about intermediate wave (5) impulse because the fourth wave overshot the previously drawn channel. Draw this channel first with a trend line from the lows of minor waves 2 to 4, then place a parallel copy upon the high of minor wave 3. I would expect minor wave 5 to most likely end mid way within this channel, or slightly less likely to find resistance at the upper edge. If minor wave 4 were to continue further as a double (unlikely but possible) then it may not move into minor wave 1 price territory. 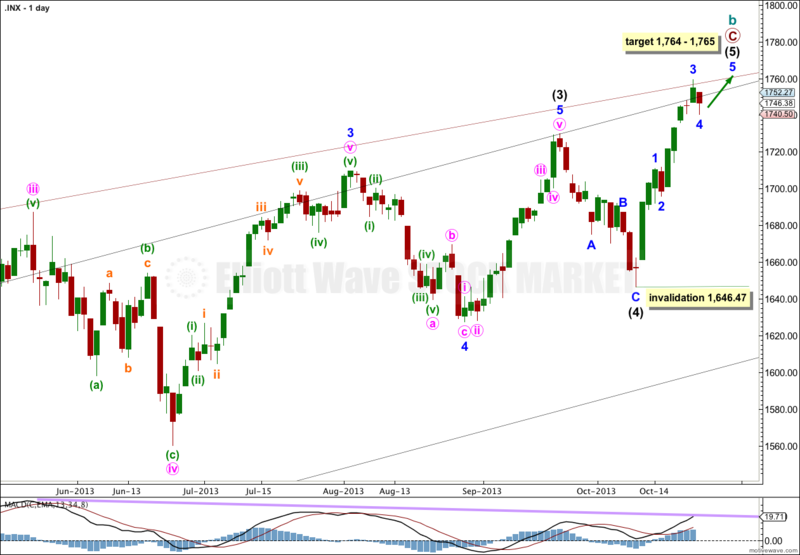 This wave count is invalidated with movement below 1,711.03. 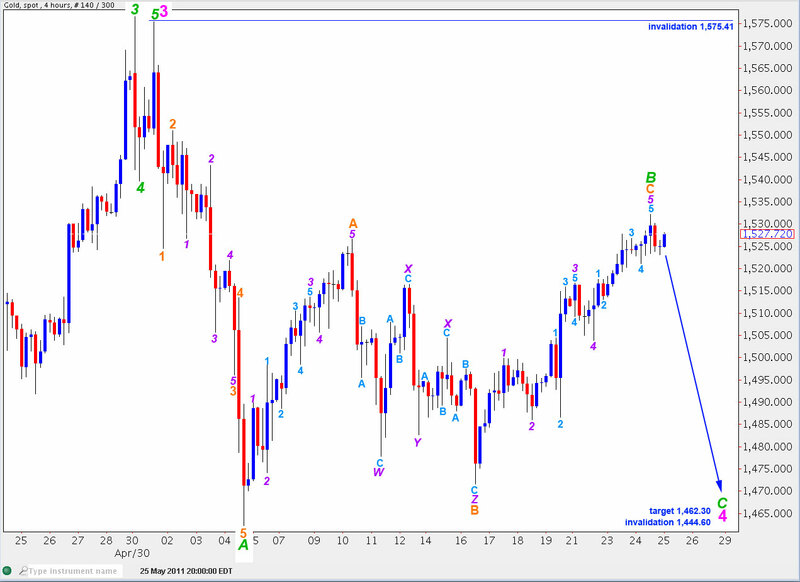 Elliott Wave chart analysis for Gold for 26th May, 2011. 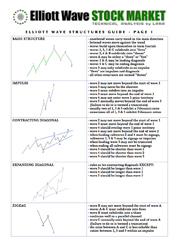 Please click on the charts below to enlarge. To see an historic count for Gold please see last analysis here. Last analysis of gold expected further upwards movement towards a target of 1,532.09 to 1,535.98. Gold has moved higher and is today within this target zone with a high at 1,532.22. Within blue wave 5 upwards of black wave 5 to end primary wave 3, this wave count sees gold within a minute (pink) fourth wave correction. Wave 4 pink is unfolding as a zigzag. When it is complete then gold will be due to make new highs (most likely) in a final fifth wave upwards to end primary wave 3. At 1,629.43 intermediate (black) wave 5 will reach 1.618 the length of black wave 3. For fibonacci ratio analysis up to and including wave 3 purple within wave B green of wave 4 pink please see last analysis here. Wave B green has corrected exactly 61.8% of wave A green. Within wave B green wave C orange is 3.76 short of equality with wave A green. Ratios within wave C orange are: wave 3 purple is 2.54 longer than equality with wave 1 purple, and wave 5 purple is just 0.16 short of equality with wave 1 purple. Wave C green is most likely to take price below 1,462.27 which is the low labeled A green to avoid a truncation. Wave 4 pink may not move into wave 1 pink price territory. 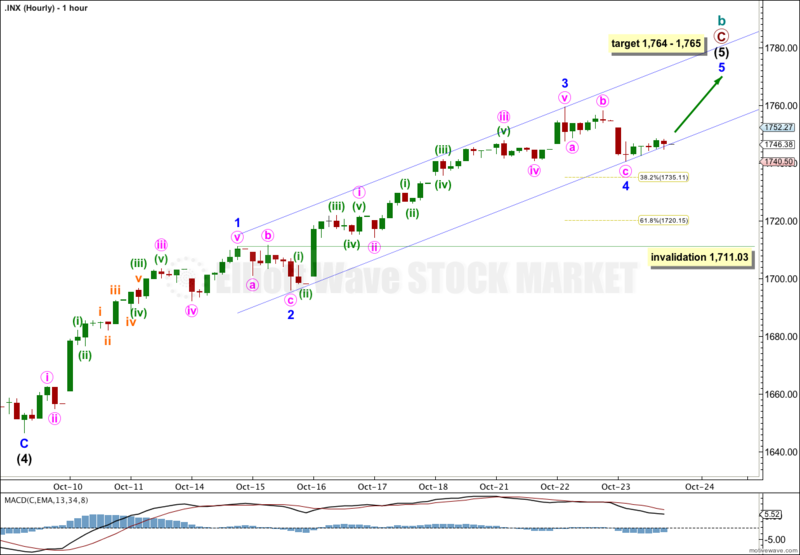 This wave count is invalidated with movement below 1,444.60. Any further upwards movement to extend wave B green higher may not move beyond the start of wave A green. This wave count is invalidated with movement above 1,575.41. 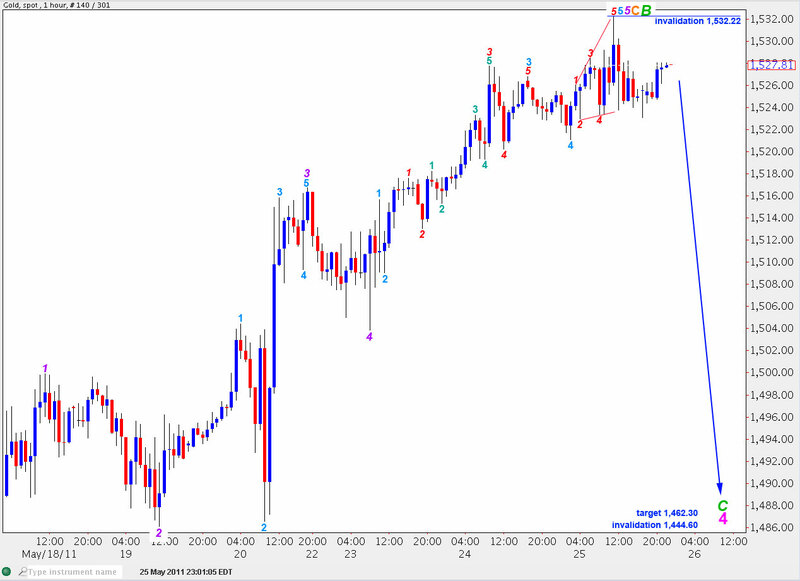 This hourly chart focusses on detail for wave 5 purple of wave C orange of wave B green, movement since last analysis. Ratios within wave 5 purple are: wave 3 aqua is 1.38 short of 1.618 the length of wave 1 aqua, and wave 5 aqua is 0.72 short of equality with wave 1 aqua. Ratios within wave 3 aqua within wave 5 purple are: wave 3 red is 0.91 longer than 1.618 the length of wave 1 red, and wave 5 red is 0.89 longer than 0.618 the length of wave 3 red. Ratios within wave 3 red within wave 3 aqua within wave 5 purple are: wave 3 teal is 0.57 short of equality with wave 5 teal, and wave 5 teal is 0.12 longer than 1.618 the length of wave 1 teal. 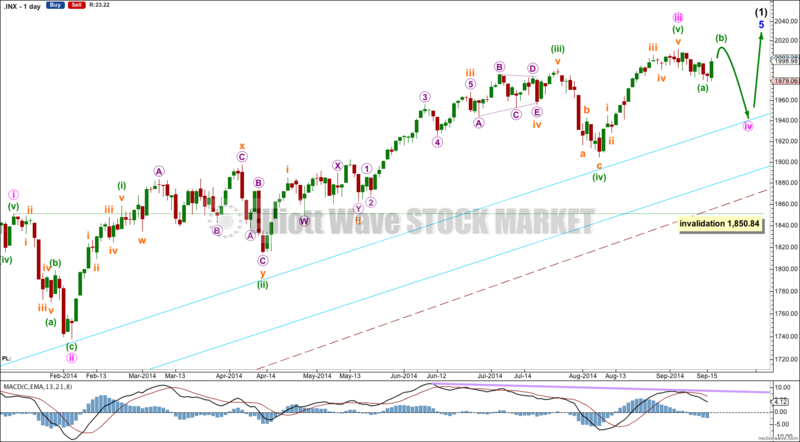 Within wave 5 purple wave 2 aqua is a shallow correction and wave 4 aqua is a deep correction achieving the guideline of alternation. Wave 1 aqua is an impulse and wave 5 aqua is an ending diagonal. 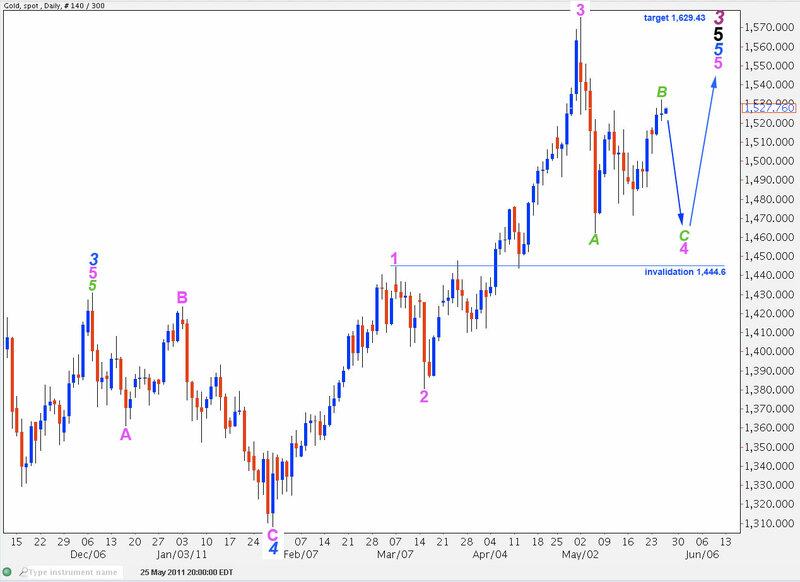 If this wave count is correct then gold should move lower in a five wave structure from this point. Movement above 1,532.22 would invalidate this hourly wave count.